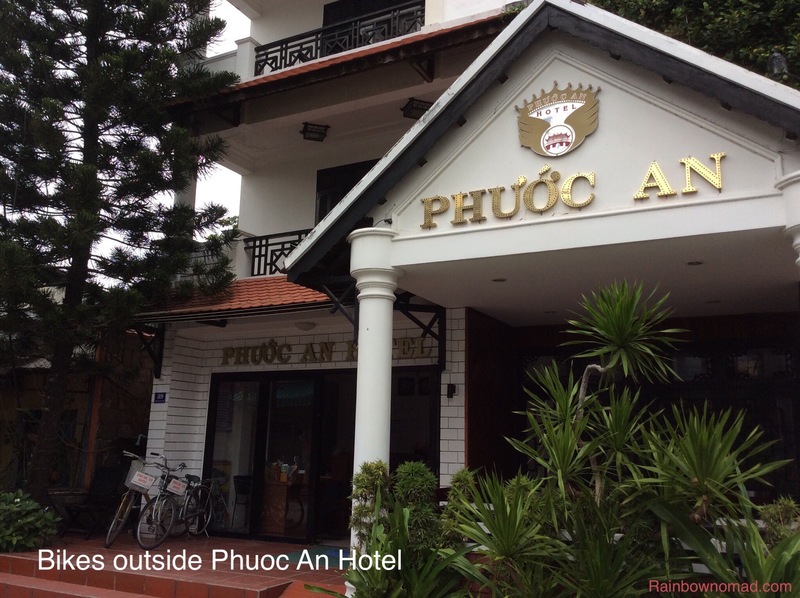 Our arrival in Hoi An coincides with the end of the wet season. This UNESCO listed heritage city is now well and truly on the tourist route and the beautiful buildings are overrun by Western – mostly young and in shorts – and Asian tourists – mostly in groups with a guide. Our hotel chosen from an ancient copy of Lonely Planet, has seen better days but it is cheap and close enough to the Old Town. And it has free push bikes. We set off to An Bang Beach along the main road into town. No more helmets and hi-vis vests which we usually wear in Australia. Ignoring reports of the high traffic accident rate here, we turn into Hai Ba Trung street among the blasting motorbikes and the occasional bus. We know traffic lights mean nothing in Viêt Nam, so we bravely cycle into the middle of a roundabout, our knees nearly touching our chins. Even with seats extended to the maximum these bikes were never meant for tall Westerners. The brakes just work and there are no gears but soon we are cycling next to the rice fields and the traffic thins out as we approach the beach. 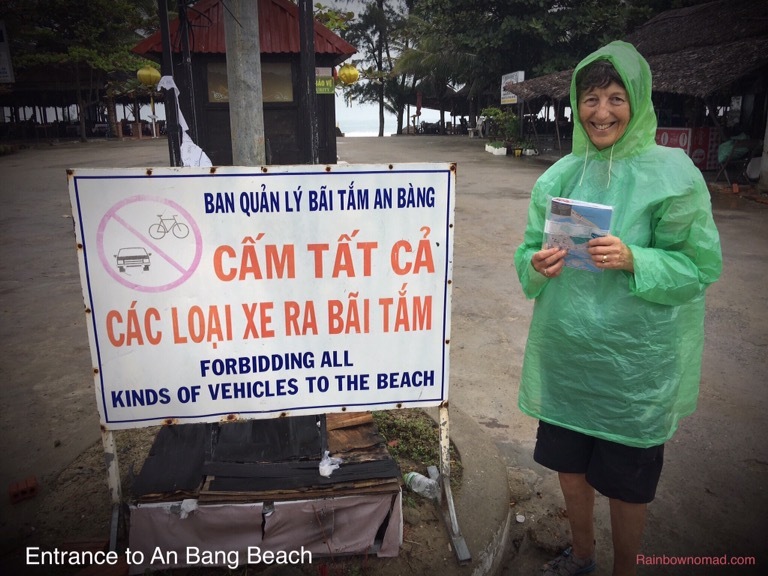 At An Bang, we are met by a man who informs us that taking vehicles onto the beach area is forbidden and takes our bikes into a parking lot, where we are given a card with a number on it. He chalks this number onto the seat of our bikes and asks for a parking fee of US$1. 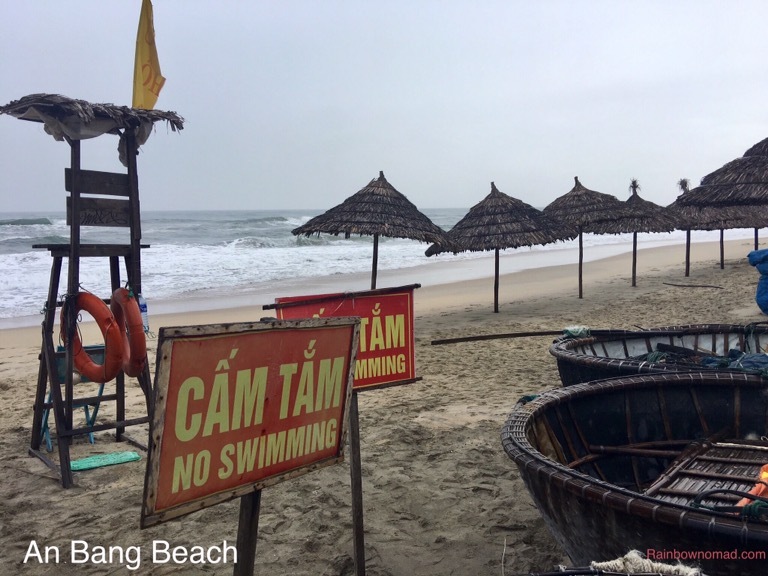 An Bang beach is after all a resort, with little thatched umbrellas and wooden deck chairs arraigned along the coarse sand and a small wooden lookout for a life guard. The beach is deserted save for two brave surfers struggling to get beyond the crashing waves. Our guidebook has described An Bang as a wonderful beach with glorious fine sand and fabulous little restaurants. At 9.30 in the morning with the wet season drizzle becoming heavier, it looks slightly bedraggled and sad. We head back down the track, after paying our bike parking fee and turn off into into Kim Bong village on Can Kim island. Kim Bong is meant to be a master workworkers village but as we wobble our way down the small laneways we discover the most wonderful market gardens. Rows and rows of lettuces, basil, mint and other greens are planted so neatly into the rich, brown river soil. 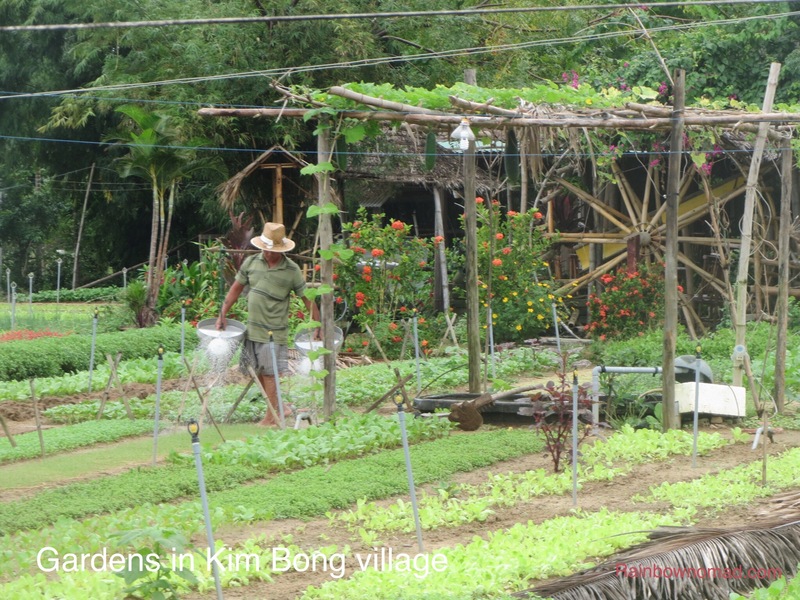 Each plot is accompanied by a water well and we watch as a farmer dips his double watering can suspended over his shoulders into one of the wells and proceeds to spray his seedlings with a graceful swinging of his hips to tip each can’s water out over the plants. 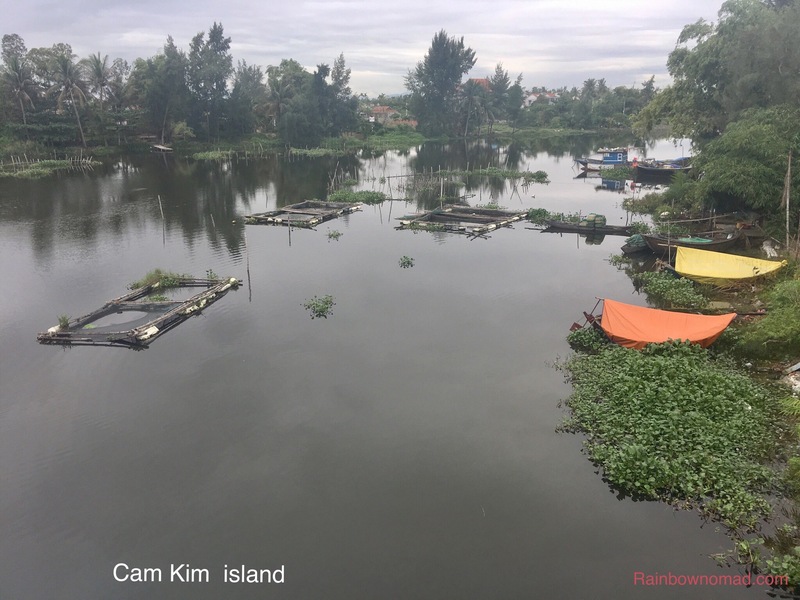 We head vaguely in the direction of Hoi An, through the rice fields, occasionally coming on villages with concrete houses surrounded by gardens. 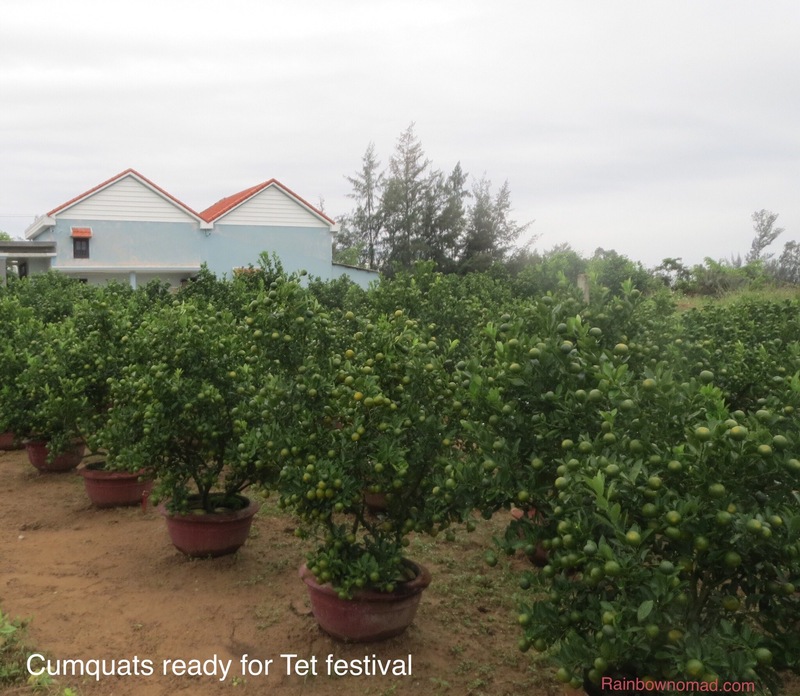 Away from the water, these gardens grow rows and rows of cumquat trees, some in pots but all about 1 metre high. The fruit is green but soon will ripen and become the Vietnamese version of ‘Christmas trees’ for Tet, the big New Year celebration. In the past, I’ve seen families transporting these trees on the back of motorbikes for the big family festival of Tet. Needing a rest for our knees, we come across a large house on a road junction that looks like it has a small shop and serves tea. As we wheel our bikes into the courtyard we are greeted by an older lady, the shop owner and her young granddaughter who manages to translate for us, vaguely. We agree on Cap Phee, wondering if we are going to be served the incredibly strong Vietnamese coffee sweetened with condensed milk. 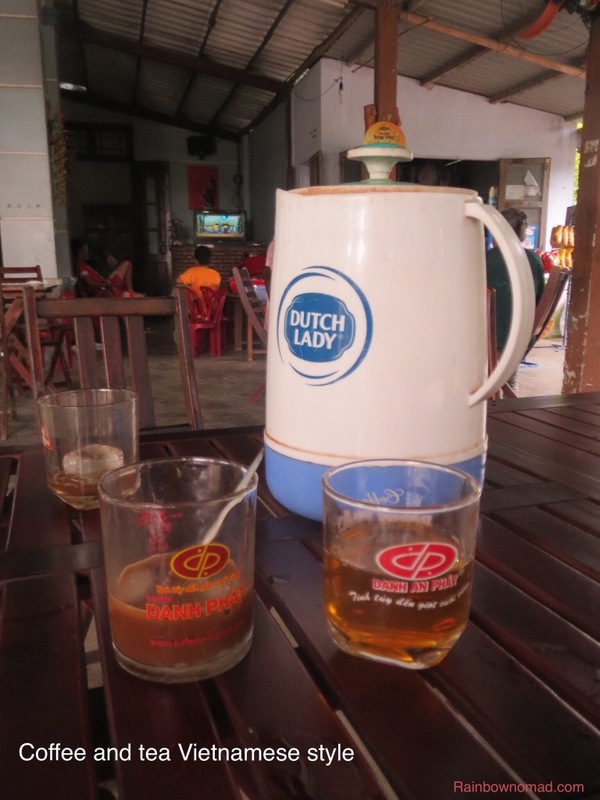 The young girl disappears into the cavernous house and our host brings over a thermos of Vietnamese tea! Such a refreshing drink! The coffee arrives cold, in a glass with a layer of condensed milk in the bottom and several ice cubes floating on top. Our hosts hover around us so we bravely stir the glass and drink up. It is surprisingly good. Our hostess returns to her ancient friends who are having a great old gossip, as hens peck around the rubbish. Two grandsons in soccer shorts appear and pay for some salted snacks from the shop. They settle down to watch cartoons. 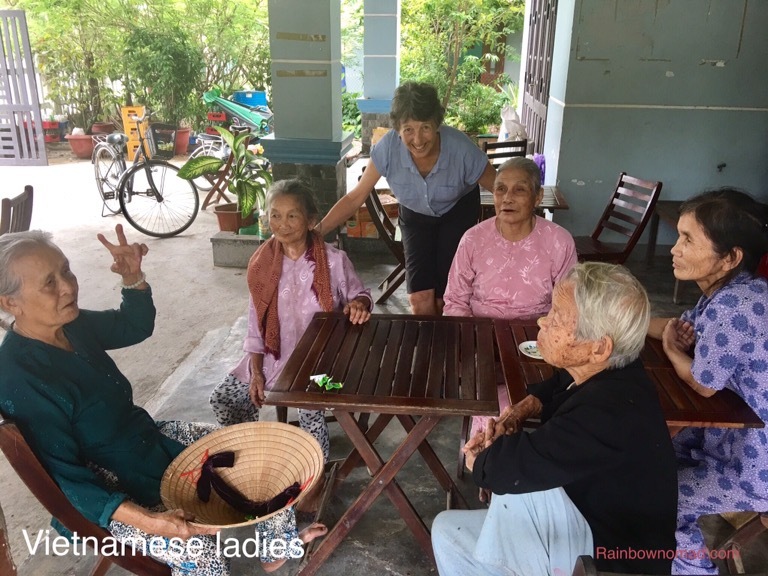 The ladies cackle away between their betel nutted gums and sort through baskets of green leaves. As we leave to pay we ask for a photo shoot. It’s the highlight of our day!